In a stand mixer add the sugar, vegetable oil and mix until incorporated. In a medium bowl sift the flour, baking powder, baking soda and salt then add in the spices. Slowly add the flour mixture into the oil/sugar mixture at a medium speed until everything is well blended. Add the eggs one at a time and allow them to blend well. Fold in the carrots and nuts. Pour into the prepared pan and bake for 60-75 minutes on the center rack of your oven. You can test for donees the same way you would for any cake by inserting a toothpick and removing it cleanly. In a small bowl mix the warm water with yeast and set aside for 5 minutes allowing the yeast to develop. In a stand mixer add the milk, sugar, butter, salt, eggs and then the yeast mixture, blend to incorporate. With a dough hook attachment begin to add the flour one cup at a time until the dough comes together and pulls from the side of the bowl. Remove the dough and place onto a lightly floured surface and knead for 10 minutes. Coat the dough with vegetable spray and return to a large bowl, cover lightly and allow to proof. The dough should almost double in size. (1 – 1 1/2 hours). Remove the dough and divide into 36 equal pieces, rolling out on a floured surface. Place the dough into a half sheet pan covered with parchment paper or sprayed lightly with vegetable spray. Allow the dough to proof again in a warm area to at least 50% increase in size. (1 – 1 1/2 hours) Egg wash then bake in a pre-heated oven at 375 degrees for 18-20 minutes and cool about 15 minutes before serving. Tiramisu which means “Lift me Up” is believed to originate from Italy. But that where it differs, some believe that it started in the 17th century somewhere in the Northwestern Province of Tuscany. Others believe it was invented in a brothel in the Northern town of Treviso. Wherever it came from, it has been a great Italian Dessert. Made with Ladyfingers, Mascarpone cheese, eggs, a little coffee and a sprinkling of cocoa powder it is a delicious dessert after a wonderful meal. At Bake Krazy Bakery we make Tiramisu from time to time along with our other wonderful desserts. Pre heat your oven to 400 degrees & line a sheet tray with parchment paper. Sift the flour and cornstarch together into a small bowl and set aside. In a separate bowl beat the eggs, egg yolk, sugar, vanilla and warm honey until incorporated. Add in the flour mixture and lemon zest to form the batter. The batter should be somewhat thick. Place the batter into a pastry bag with a large plain tip. Pipe the pastry dough 4″ long onto a sheet tray lined with parchment paper. Dust with the confectioners sugar and bake for 10 – 14 minutes until the edges are slightly brown. Remove and cool completely. Beat the egg yolk with 1/2 cup of the sugar until light and fluffy in a sauce pan. Over a medium heat add the milk stirring constantly until the mixture boils. Boil for approximately 1 minute, then remove from the heat and allow to cool in the refrigerator for 1 hour. In a small bowl add the remaining sugar along with the egg whites and mix at a high speed until stiff peaks form. Remove the egg mixture from the refrigerator and whisk in the mascarpone cheese. Fold in the egg whites. Mix the coffee with the brandy and sprinkle or dunk the ladyfinger into the mixture. In a the 8″ glass baking dish pour in a small amount of the mixture followed by ladyfingers then more of the mixture ending with the mixture at the top. Refrigerate for at least 2 hours, then apply a generous amount of cocoa powder. I love monkey bread, but who wouldn’t when you add butter, sugar, cinnamon and dough together. What’s better. 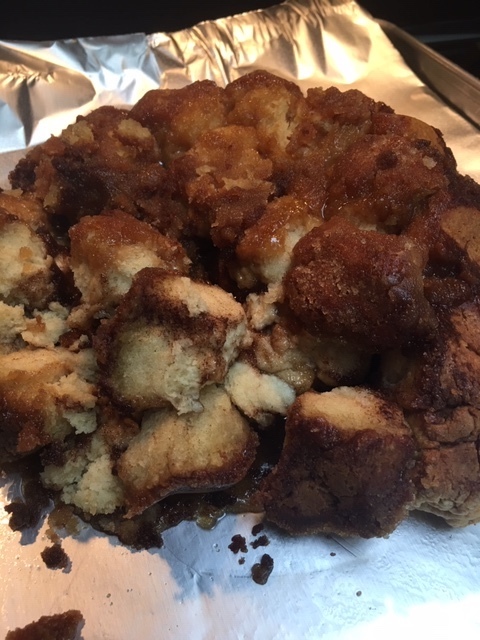 Monkey bread is also know as puzzle bread, sticky bread, pinch me cake and several other names. Made of a sweet pastry with cinnamon and sugar and often served for breakfast and at fairs. The dough can be made from yeast or a quick bread style using baking soda and baking powder. The fastest way would be to use a store bought biscuit dough and this is simple. All you do is roll the biscuit dough into 1″ balls, coat with cinnamon sugar, add butter and brown sugar, bake it and you’re done. 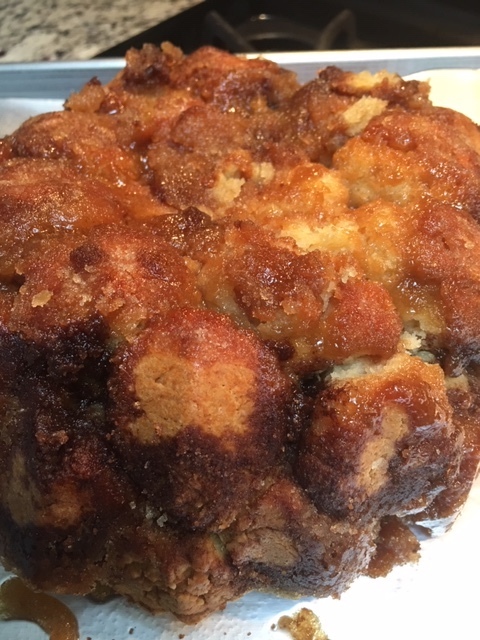 When the bread is done you just pick at it like a monkey would…..and there you have it, monkey bread. Here is a recipe I use which is the quick bread style. In a sauce pan melt 1 1/2 cup of brown sugar and 3/4 cup of butter, stirring well to incorporate. Once well blended and the sugar has dissolved remove from the heat and set aside. In a small bowl mix the remaining brown sugar and cinnamon together and set aside. In a medium bowl mix the flour, baking powder, baking soda and salt together. With a pastry cutter add the cold butter into the flour mixture until crumbles form then add in the buttermilk. Mix together to form the smooth dough. Pour half of the butter/brown sugar mixture into a greased bundt pan. Roll the dough into 1″ balls and then roll into the cinnamon/sugar mixture. Place half of the dough balls into the pan. Cover with half of the remaining cinnamon sugar mixture and the remaining butter/sugar mixture. Add in the remaining dough balls and sprinkle with the remaining cinnamon sugar mixture. Bake in the center oven at 350 degrees for 25-30 minutes. Allow the monkey bread to cool about 1 minute then invert onto a desired plate. Every year when I was growing up our family would visit my aunts and uncles in the area on Christmas Eve and exchange gifts. I remember going to my Uncle Melvin’s house and always finding these German cookies. They were slightly hard and coated with powdered sugar. Coming from a family named KLAUSS I guess its no surprise that I’m German so I had to make these cookies. Now that I have, I think it’s going to be something I continue to make each year in remembrance of those family gatherings and of my heritage. In a standing mixer with a paddle, cream the butter and sugar until light and fluffy. Beat in the eggs, molasses and anise extract. In a medium bowl add the flour, baking soda and spices, mix well. In the standing mixer slowly add in the flour mixture to the cream mixture until well incorporated. Refrigerate for a least 1 hour. Lightly grease 3 half sheet pans and using a small scoop make 1″ dough ball and place 2″ apart onto the prepared pans. Bake at 375 for 12 – 14 minutes (tops should look cracked). Cool until slightly warm. With two small bowls mix 3/4 cup of confectioners sugar with milk and vanilla extract in one and place the remaining confectioners sugar in the other. Dip the tops of each cookie with the milk/sugar mixture then roll into the dry confectioners sugar…coat well. Place on a cooling rack until completely cooled. I decided to make a pie in a 16″ x 12″ baking dish instead of the traditional pie pan. This recipe has that sweetness with a little tart flavor and once you start eating it you will love it. You could also add chopped walnuts to add that crunch factor. To make the pie crust add the flour and salt to a medium bowl and mix well. Add in the cubed butter and with a pastry cutter. Blend the butter into the flour to form a crumble mixture. Slowly add the ice water while kneading the dough to make a dough which is smooth and well together. Wrap into a ziplock bag and refrigerate for 1 hour. For the filling mix the corn starch with the water and blend well. Add the corn starch mixture into a medium stock pot along with the remaining ingredients and mix well with a spoon. Heat to a boil stirring occasionally then reduce to a simmer. Simmer for approximately 10 – 12 minutes. Remove from the heat and allow to cool. While the mixture is cooling pull the dough from the refrigerator. Divide the dough so that one half is slightly larger than the other. Take the larger dough and roll out on a floured surface with a rolling pin. Make the dough approximately 16 x 12, then place into the bottom and 1 1/4″ up the sides of the baking pan. Add the filling. Now roll out the second dough out to 14″ long and 8″ wide then cut into 1/2″ strips. Lay out some strips evenly one way diagonally, then the remaining strips in the opposite direction forming a sort of weave. Pinch the top dough strips into the sides. Brush the top with orange juice and sprinkle with sugar. Bake at 375 for 45 – 55 minutes. Cool on a cooling rack.